The first ever skratch sound effects tool for DJs specifically designed with the skratch battle DJ in mind! Continuous samples and beat snippets close together for skratch/juggle friendly usage. 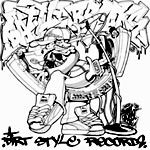 Made in 1991 and started the whole world of skratch-break-battle records.